Could Harvey Updyke’s apocryphal newspaper clipping have been a story on the Party For The Retirement Of Bear Bryant? At first you you were like, “what?” And then you were like “you son of a…” And then you were maybe like, “I mean, surely not…” And then you went up to the library at midnight and after scrolling through all the microfiche you were like “you son of a…” again. But the one thing that might lend the tiniest credence not to Harvey Updyke’s claim that Auburn students rolled Toomer’s Corner after Bear Bryant died (they didn’t), but at least to the possibility that there was indeed a newspaper article or a scrawled on napkin or at least some sort of documentation that Harvey might have been mailed by the one friend in life he may have once had (as “Al from Dadeville” claimed in his infamous call to Paul Finebaum’s radio show), some sort of documentation of at least a perceived slight to The Bahr that Harvey might have let ferment into figment and fuel his hatred of Auburn and its traditions is the Party For the Retirement of Bear Bryant. Given Harvey’s obvious dearth of discernment, it certainly seems possible that he might not have realized that the People For the Retirement of Bear Bryant, also known as the Party For the Retirement of Bear Bryant, was a two-person Auburn student political party, and not, you know, a massive BYOB throw down at Toomer’s Corner. 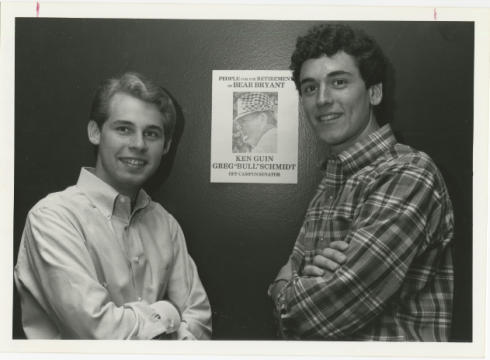 The one-time, get-elected gimmick was the brainchild of Auburn juniors Ken Guin and Greg “Bull” Schmidt, both of whom were running for Off Campus Senator in Auburn’s 1982 SGA elections and looking for a way to distinguish themselves from the long list of candidates that most Auburn students who actually took the time to vote had never heard of. At first, the two came up with the “Vote for Me” party; fairly good, but not quite what they had in mind. The idea that stuck was successful in a big way. Not only by winning the election, but by leading in votes, Greg with a little more than 1,000 and Ken, second with about 850. After deciding on the party’s name, to avoid liber, they thought it might be smart to let Bear in on their scheme. Ken called his office and Bear wasn’t in, but his secretary listened. Ken said that she sounded disgusted with the idea at first, but with a little subtle persuasion they convinced her. When the winningest coach in history found out about it, he agreed to have his picture made with both of them for their campaign posters. But the elections by then were too close to coordinate a time and pace. 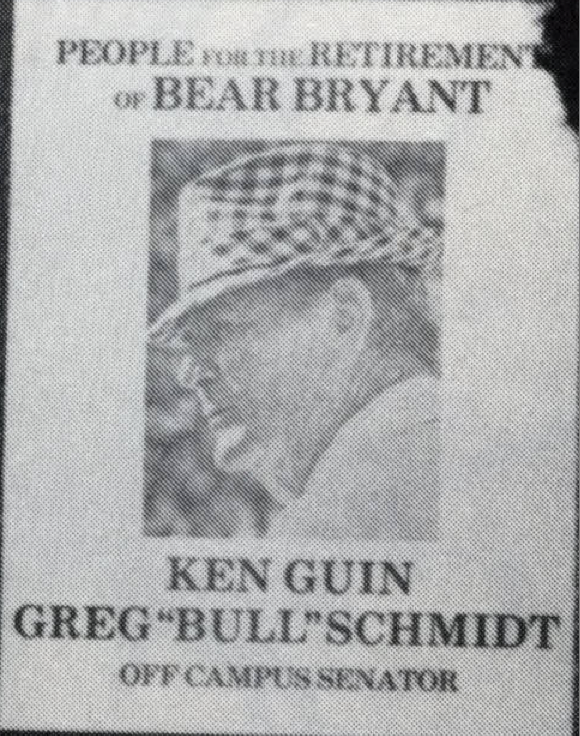 Instead, Ken and Greg wen with the typical profile—a houndstooth cap picture of Bear. Apparently they had a hard time keeping the posters up; everyone kept snatching them as souvenirs. Guin apparently took a lot from the experience as well. He made a career out of sleeping with the enemy, representing Tuscaloosa in the Alabama House of Representatives from 1994 to 2010. Related: Bear Bryant’s lost year at Auburn. Wow, Ken Guin with hair! That hat doesn’t look like houndstooth; it looks checkered. Top notch, Big Man. Top notch. I give the men credit – SGA election campaigns are usually boring or based on Greek affiliation. Awesome story. Moral: make sure you have all the facts straight Updike and the like! In a lot of photos he is wearing something other than houndstooth. Yet another Bama myth?